To celebrate the 100th anniversary of its first patent, IBM has published a gallery of photos spanning a century which show its employees engaged in innovation. This incredibly cool bald man in sunglasses is part of the series. 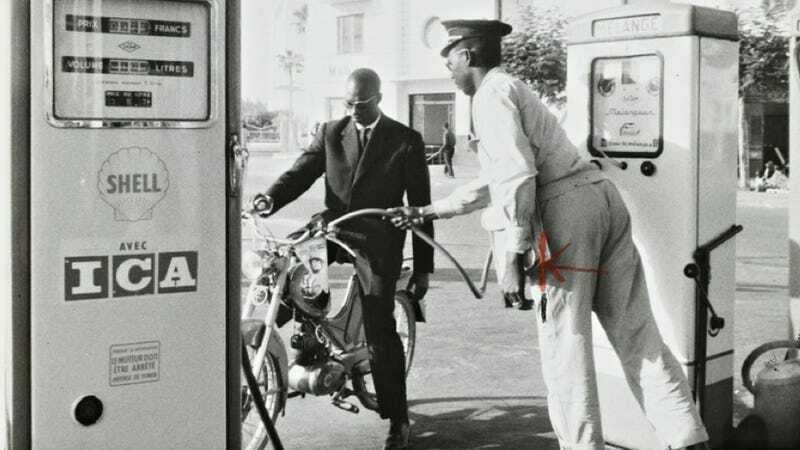 He’s in Dakar, Senegal, in 1960, and he’s stopped to get his scooter filled up on the way to work “at the start of a typical day”, as the caption puts it. Tank filled, scooter scooting away, IBM man arrives at this great Bauhaus office in Dakar. One cannot help but wonder about an innovation pictured here which is entirely unrelated to IBM’s core business of computers: keeping human beings alive in black suits in the infernal heat of West Africa. Photo Credit: IBM. Hat tip to Scanzen.